These will be set together shortly. 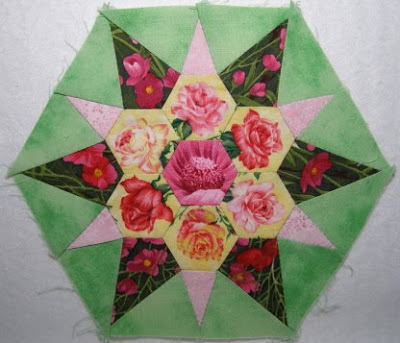 Be sure to visit The Quilting Professor (click on the link on the blog list at right) to see her version of this quilt. They all look so different! I had another set of blocks almost done using the same background. Unfortunately, I didn't have enough background for two blocks. The good news? I had not set any of the background pieces into the blocks yet! Today I got a medium pink tone-on-tone that I think will work. 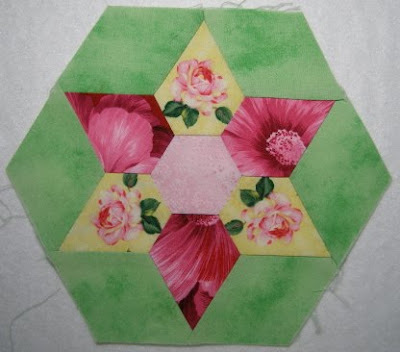 Looks great with the border and the block center I took with me. Bought a lot of fabric for me and a bunch for the upcoming retreat. Also found Maxine fabric to make potholders and coasters for a friend. Backing for one quilt, border for another, batiks for a new sample. And best of all--it was all on sale! How can you beat a deal like that? Enough for tonight. My pillow is lonely. 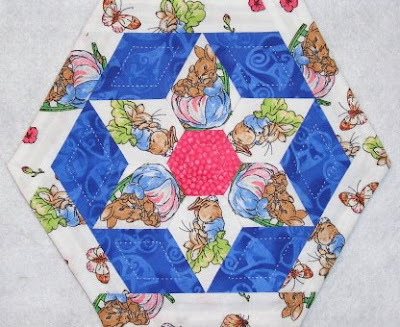 Last night I showed you some hexagons that I had made into candle mats. 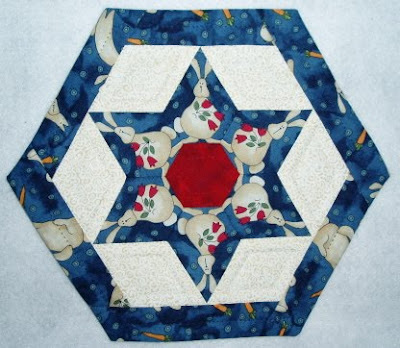 Tonight and tomorrow night I am going to share seven hexagons that will be made into a bigger hexagon for a wallhanging or a tabletopper. This is the Morning Star. 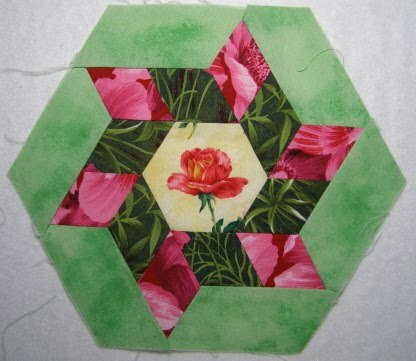 The rose print is from Northcott's Flower of the Month line. I fussy cut it so much that I had to go buy another half yard! Lots of holes in the first piece...you just have to live with that if you want to fussy cut! More of these blocks tomorrow. Looking back at some of my earlier pieces, I realize how much I love to fussy cut. Six pointed stars, Texas stars, hexagons, Dresden Plates...everything is fair game! 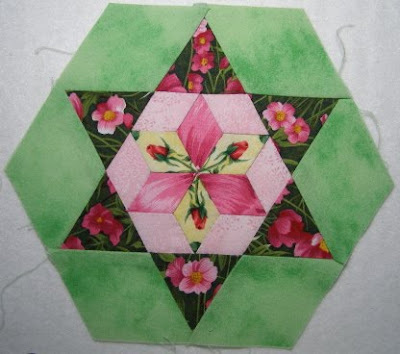 I have a class finishing a hexagonal quilt, with seven pieced hexagons making up the center. That may be what made me remember these small "candle mats". These make great gifts, as you can choose the fabrics to match the recipient's personality or interests. The first one is made with salt and pepper shaker fabric. The elongated pentagons are cut in pairs and placed opposite each other. Check out the cat face center! Next is a rabbit design. 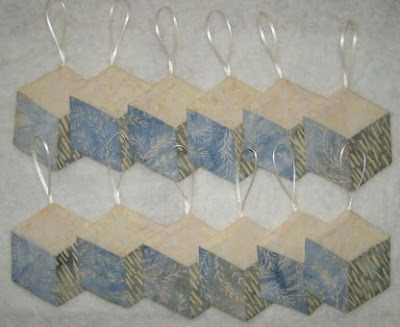 I only had scraps left from a different project, so I cut in sets of three and alternated both sets. 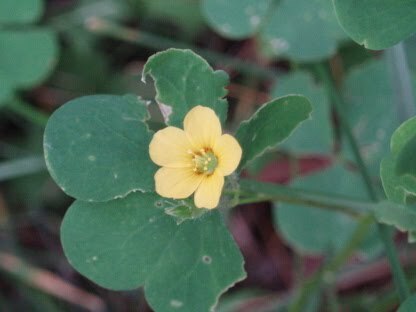 Notice how the flowers go left on every other one, and right on the others. The red center makes the tulips pop. Beatrix Potter...what's not to love. Soft, beautiful designs. Again, using sets of three alternating. With a darker center and setting diamonds, the rabbit fabric takes center stage. All three pieces were sandwiched and turned so that they did not require binding. Each measures about 8 inches and all are hand quilted. Add a candle if you are so inclined and in a couple of evenings you will have an amazing gift! Enjoy what is left of Thursday night and have a wonderful Friday! Seven extremely talented ladies learned my way of doing binding and sleeves today. When I whipped out my dowels to show them the difference in the sleeve types, several thought I had brought them for punishment! So, Harry Potter, move over, because I did an expelliamus (how does one spell that anyways?) spell (no pun intended). Several thought they were too far across the room to be affected, but I had brought two different length "wands" and their fears were--ahem--expelled. Tee hee x infinity! I am hot and tired and obviously giddy. Thanks, Deb and Janet, for playing the guessing game. Deb was right--they are hollyhock buds. I'm off to the land of nod. I'll try to do a better post tomorrow. P.S. How do you like the new blog design? Linda, I tested the comments on my system with dial-up and it appears to be about normal response time. Please don't be discouraged--it was great to hear from you! Janet, many thanks for the lovely card--the design is fabulous! 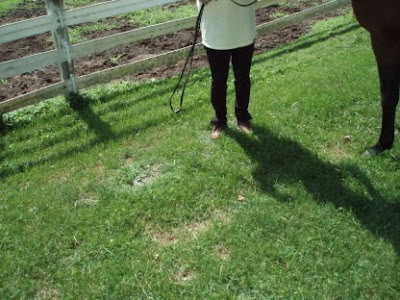 And, Jay, those blocks on the horses' tail blog are the places where the fencing joins. Each "block" covers the ratchets and adjustors that keep the fence from sagging. What a strange mix of things I have done today. Started with using my still beloved Dyson cleaner to vacuum upstairs and down, plus the stairs themselves! Even "dusted" along the crown molding--where did those dust webs come from? Dismantled the ceiling fan and cleaned the blades and globes. Cleaned the washer inside and out and even used it! Sorted out stuff (lots) to go to the thrift shop tomorrow. I've done a semi-private workshop on applique. And managed to find a spare hour to horse around. No riding, but everyone got the good scratching they so love. Now I am blogging and then I am going to bed. Tomorrow is another day and the list of to-do's is still long. 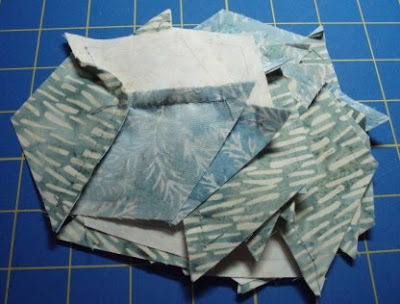 I'll try to take some pictures of quilting stuff for the blog tomorrow. I know, I know...you will hardly know what to do. It's hotter than Hades in this basket. Okay, okay, it's the best I could do with the heat and humidity! Eight Featherweights had a good cleaning and polishing at Patchwork Plus in Marcellus today. It's always so fun to see them working more easily and to see them shine. Spent some time this evening polishing tack: two halters, Hallie's bridle and girth, and my barn/riding boots. Now I'm trying to decide whether to try to stay up a while longer or just give in and go to bed. I think I hear the bed calling, so maybe that's the best plan. This picture is about what it looks like around here, except it is Lake Champlain in August 2009. But that heavy, humid feeling is exactly the same. We've had heavy rains throughout the day, increasing the humidity each time. I spent part of the day cleaning the tack/feed room where I ride. A small, enclosed area--you can imagine being there, can't you? I washed walls, organized the tack, vacuumed. It will be so much easier to find the stuff we need--and in a timely manner. Who knew? I just finished reading "Sizzling Sixteen" by Janet Evanovich and am listening to "Lucid Intervals" by Stuart Woods. Here's a hint... And, no, surprisingly, my arm is not long enough to have taken that shot! Or this one--you can see both my hands! This is Hallie, a 20 year old Morgan mare. She hadn't been ridden in about 8 years, so today was our maiden voyage. I considered it a success--I stayed on, mostly at a walk with a bit of trotting, and she didn't buck me off or do anything too frisky! You will notice that I am properly attired in breeches, boots and hard hat. These pictures are actually after we had been in the ring, and, no, there are no pictures of me riding. Perhaps next time! Hallie is about 17 hand high, or about 68 inches at the top of the withers. 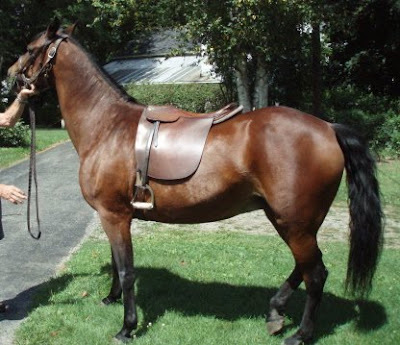 I am learning to ride saddle seat and the saddle sits back further than most English saddles to allow higher action of the front legs/shoulders. This is the saddle that I polished and photographed for an earlier post. A day to remember. 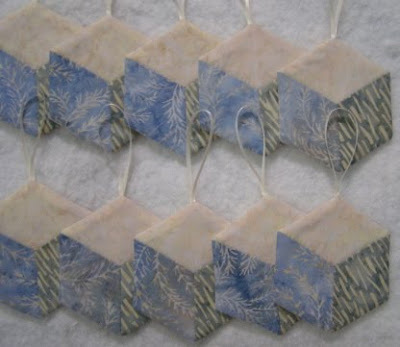 Eight eager ladies learned how to make fussy-cut Dresden Plates for wonderful wallhangings. A wide range of fabrics from large scale florals to penguins and igloos were cut and hand pieced. The hours flew by in a blur of fun, creativity, laughs and M&Ms. You never know when you will need emergency help. Tonight in class one of the ladies had a diabetic emergency and we had to call the EMTs. They (and the fire/rescue squad) arrived promptly and helped to stabilize the lady. Her husband came and she felt well enough to not be transported to the emergency room. The EMTs were kind, respectful, courteous. And very skilled. It's so hard to know when to call for help and when to let a person choose for themselves. The other students were wonderful, and we all were thankful that she was okay. So, to EMTs everywhere, THANK YOU! You make a difference very day--literally a life and death difference. And please remember, everyone, not to take even little things for granted. Life is so precious--let's make the most of it. Today I had the pleasure of helping twelve ladies learn how to take care of their Featherweights. Barb had just gotten hers and had not even sewn on it! She was giddy with excitement! After oiling and lubricating the machines, we waxed them to a spit polish shine! Then the tension was balanced and we adjusted the pressure to the presser foot. Not to mention marking for a scant 1/4 inch seam allowance. Happy machines, happy owners. A great start to the week. Hope your start to the work week was as fun. Here's the excitement of the day: I cut up a downed tree with my trusty hand saw and then used the same saw to trim some upright trees and then I mowed the lawn. 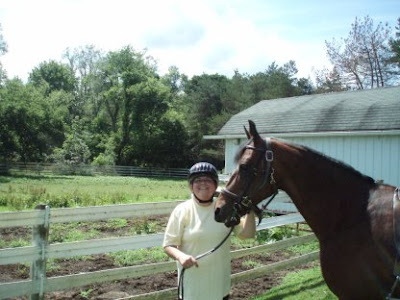 Did a bit of horsing around, packed for class tomorrow and now I am blogging. Did you stay awake through all that? Even Lynnie and Callie are snoring behind me. Today was spent in the company of eight delightful women, all intent on learning how to hand quilt Sharon's Way. Most had quilted before using the rocking method and poking their underneath fingers. All left doing an excellent job of avoiding that unpleasantness and with great stitches both front and back. Six hours flies by in the blink of an eye. Changing the world with quilting--who could ask for more. As an added bonus, at the end of class, who should I see but my very bestest friend, Cindy, and her husband, Ron! Cindy was shopping for backing fabric for our latest mystery quilt, and eyeing fabrics for the next one! It was so good to see both of them--a truly serendipitous blessing. Good night (or good morning), everyone! They really do flock together! Imagine my surprise to look out my sewing room window and see both the male cardinal and the phoebe so close together. 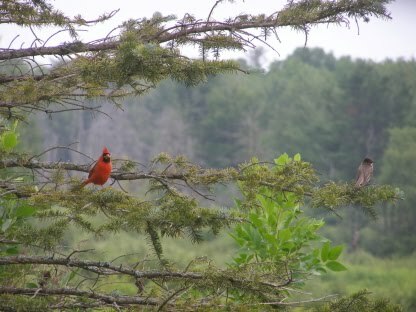 And...on the other side of the tree, there was a catbird...but too far over to get all three in the same shot! The ground hogs are growing--Diane suggested that if there had been seven babies I could have named them after the Seven Dwarfs! Too funny. At the moment I call them all Speedy, because they run like crazy for the nearest hole when the door opens! That's it for tonight--short, sweet, and to the point! Has anyone received an envelope yet? First, a memory check. Do you remember my 200th post, which coincided with my two year blog anniversary? And, those who left a comment on that post were eligible for a prize. Well, some people who had been lurking delurked, the regulars were, well, regular, and it was impossible to choose just one winner. So I decided to do a bit of something for everyone! 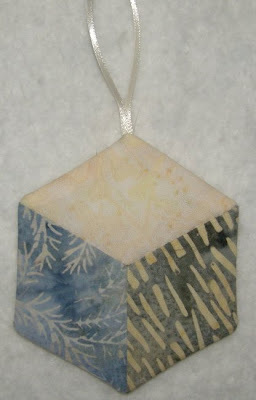 Each ornament is made from the same three fabrics but all are subtly different. I will not make up this combination of fabrics again, so these are a limited edition run. These went into the mail today, except for Sheila (still looking for the other item you wanted), Kelly, and Jane. I still need addresses for two of you, so I will continue to hold your ornaments. I know it took a long time to get these done--all I can say is...life intervened. But you should have them in your hands soon--Enjoy! Have you noticed how life changes--whether you like it or not? People move away, loved ones pass away, friendships end. But I truly believe that when a door closes, God opens a window. So many good things have happened in my life for which I am truly grateful. And I choose to believe that the sad times have made me stronger. So tonight let's take stock of the good and great things in our life and know that when tough times come again, we are strong enough to withstand them--and we will come out even better on the other side. Please know, because I know you are wondering, that nothing bad has happened to me today--just in a nostalgic mood. Thought I would share...and perhaps help each of you realize that for the most part we are luckier than we sometimes think. A short post tonight. I have a dear friend who absolutely loves anything with ants. So I tend to take pictures of them when the time is right. The rest of you can come along for the ride. Another pretty productive day quilting-wise. I put binding and a sleeve on the quilt I couldn't do last night, prepped a block for a hand-piecing class that I taught tonight, and found a few unexpected things in my sewing room! Good things...in case you were thinking otherwise. I'm not sure if I'll do much more tonight--maybe take from now until midnight off! 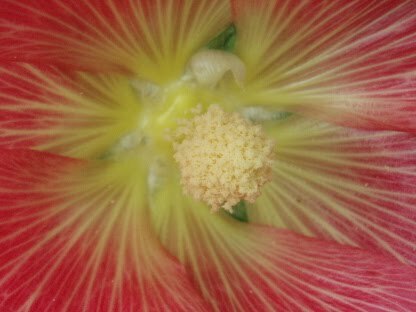 Ever since I was very young I have loved hollyhocks. 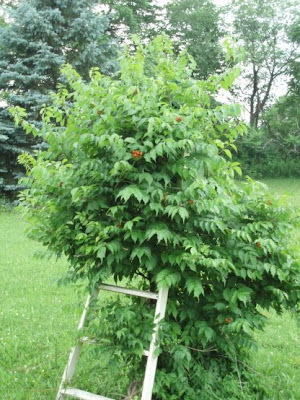 My maternal grandmother had them growing along side the house while I was growing up. 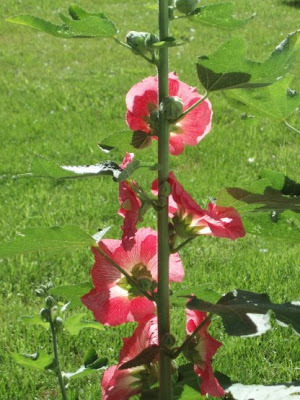 Several years ago, after we built our house, I had the perfect spot for hollyhocks on the east side of the house. 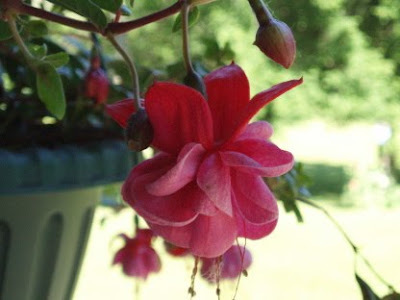 I planted about six plants each year for two years and have never bought them since. The trick is to let the stalks dry each fall and then cut them down and put them flat onto the flower beds. 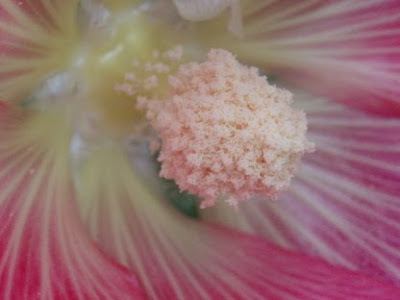 The seeds fall out into the mulch and, voila, hundreds of baby hollyhock plants. Last year I gave cups of them away and they are blooming in other people's gardens this year. The even more surprising thing is that the colors change every year. 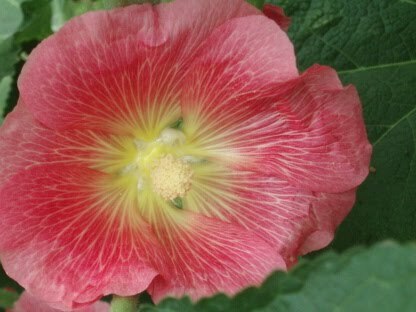 This year I have a crimson flower, along with several shades of pink. Some years I have yellow, a pale lavender, a dark almost black maroon. It's the luck of the draw! 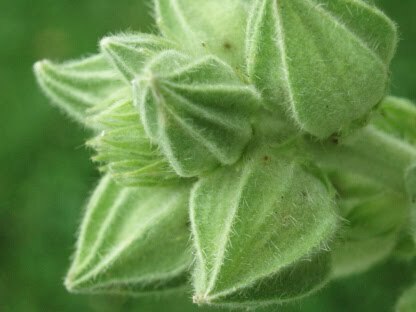 Same flower, just ever closer. I can understand Georgia O'Keefe's fascination with flowers! 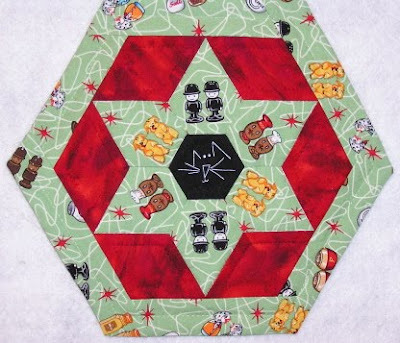 On the quilting front, I have put binding on two tablerunners and a small gingerbreadman cutwork design. I was actually able to use a brown binding on the gbman that I had made and decided not to use on something else--apparently quite some time ago, because I don't remember what I originally thought it would work for! 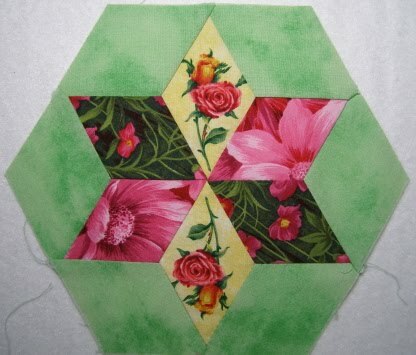 I took apart an applique sample and reset it with the other six blocks (for a total of 9) and it looks marvelous! 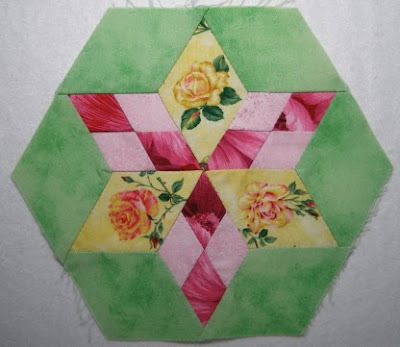 Also made some changes to a second set of these applique blocks, but didn't get a chance to applique them today. I have one other quilt ready to bind, but Callie keeps laying on the fabric laid out on the cutting table. So maybe I'll do that tomorrow! I'm listening to "U is for Undertow" by Sue Grafton and reading "Sizzling Sixteen" by Janet Evanovich. Both are excellent. Just finished listening to "Blue-Eyed Devil" by Robert B. Parker. It was especially poignant as this will be the last in that series, as Mr. Parker passed away earlier this year. I am a big fan of all of his books--a big loss to the literary world. Gotta run for now. 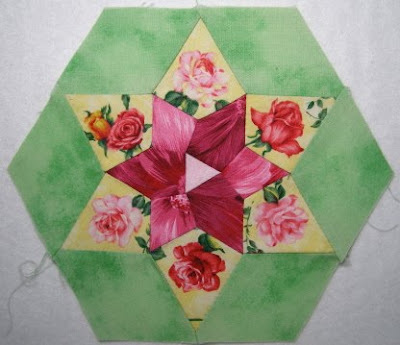 It's almost midnight--the witching hour--shall I keep quilting or shall I go to bed? Hmmmm...you'll have to tune in tomorrow to see which! A couple weeks ago I was walking the lawn before mowing. I saw something orange near a lilac bush and wondered what it was. 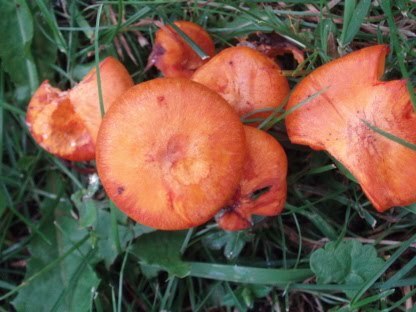 Imagine my surprise when they were orange mushrooms! 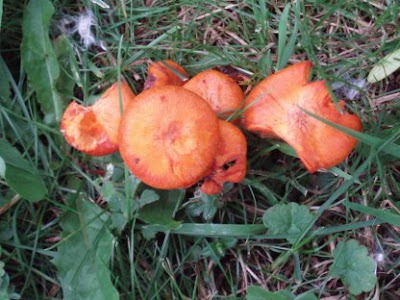 Maybe they are "magic" mushrooms!!!! I'm not sure--definitely didn't eat them or whatever. Just thought they would make an interesting blog post. Anyone know anything about them? Lest you think I preserved them you would be mistaken--off with their heads when I mowed! Cooler sleeping weather--gotta love that. P.S. I wanted to make sure that psychedelic was correctly spelled and went to dictionary.com. The related searches field turned up "Shrooms" which just made me laugh out loud! Several years ago my dad painted an old ladder light yellow and gave it to me for my trumpet vine. The vine had originally grown up a dead birch tree, but one day the birch tree fell over! Rotted, you know! So the ladder was the replacement. 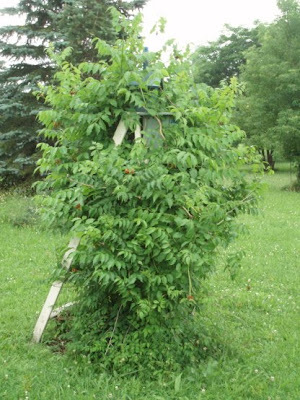 If you look closely, in the first picture, you can barely see two birdhouses hidden among the leaves. 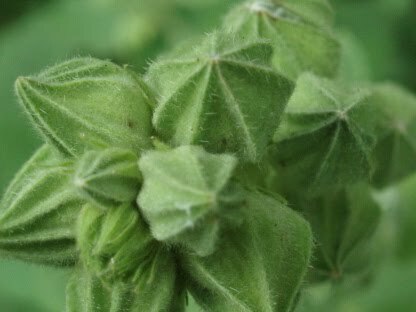 A slightly different view--see the orange buds? Have a wonderful Sunday, everyone. I'll be back tomorrow with...stay tuned to see! P.S. 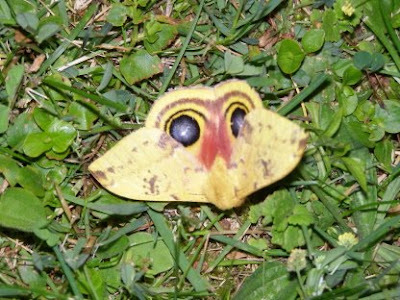 Janet, the moth was only a couple inches across. I can't imagine one as large as yours! I have this uncanny ability to conjure people. Do you ever have someone in your thoughts--kind of out of the blue and definitely persistent? Could be over a couple days or a week or so. And then, suddenly, there they are! Tuesday night several of us were talking about someone we care about very much, but we haven't seen her in quite a while. We asked others if they had seen her or knew anything about her and was she okay. No one had seen her or heard anything about her, so we left it at that. But she was still on my mind. Lo and behold, tonight, in the middle of a torrential downpour, I stopped at the grocery store. There I was in the meat aisle minding my own business when someone said, "Sharon!". I turned to find...yep, you guessed it, the person who had been on my mind! I dropped everything I was holding and gave her a huge hug and could not believe my good fortune! For those of you who read the blog and know who I mean, she is fine, busy with work, dropped out of guild. She looks wonderful and is still happy with her big life decision. So pay attention to those thoughts of someone--you might be able to do a bit of conjuring of your own! One night I was out after dark and found this on the ground under the dusk-to-dawn light. Rumor has it that the spots drive away predators. 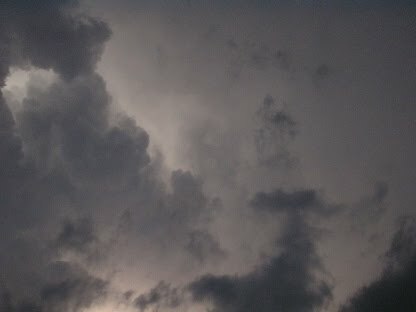 Viewed from this angle, it almost looks like an owl with wings up to cover part of its face! Still cool. I don't know about any of the rest of you but enough is enough. I am cooked (overcooked actually) and I can't take off any more clothes in public. Air conditioning feels great when you first walk into it, but then the humidity seems to take over and you feel clammy and sticky again almost immediately. Let's hope this is the August heat wave early and we won't have to suffer through this again next month. 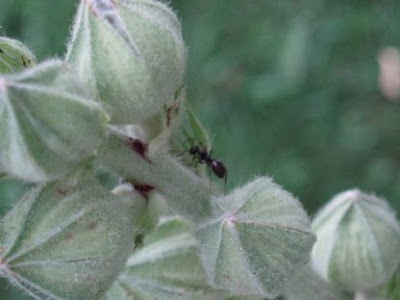 Ants must be as productive as bees--just no honey to show for that busy-ness! 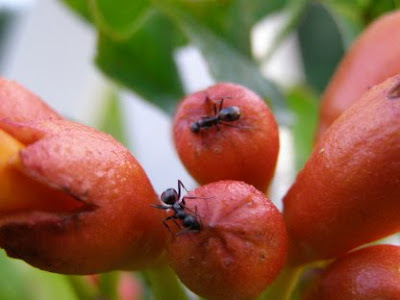 Ants help to open peony blossoms and they are working on the trumpet vine now. And all without air conditioning or other respite from the heat. Keep cool if you can. As Sandy said in class today, "there are no cool spots on the sheets." Truer words were never spoken. 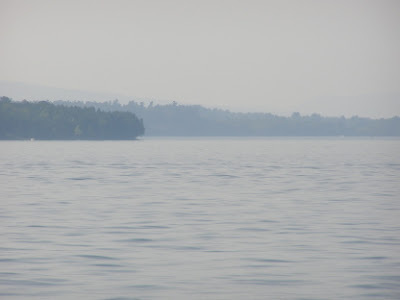 It has been unbearably hot here in central New York the past few days and the forecast is for more of the same and worse. It's not cooling down enough outside to cool down the inside of the house at night, so what passes for sleeping is actually more of trying to find a new cool spot on the sheet! 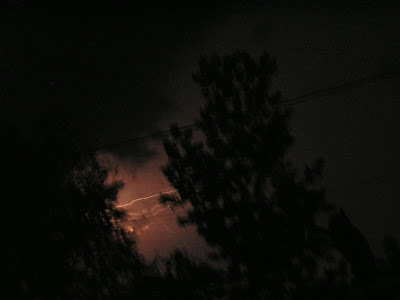 It's surprising that we haven't had any bad thunderstorms (yet!) with so much heat and humidity. I have the prizes done for the 200th blog (which you have probably forgotten about!). I still need addresses for Kelly J. (Canada), MAC, Sylvia, and Jane Martin. Please email these to me at sharon@sharonstroud.com so I can get these lovelies in the mail this week. I hope you will like them. Gotta run for now. Have to do some final touches on the classes for tomorrow and then look for that cool spot on the sheet! Hard to believe that a year has flown by and Nate is now a yearling. These pictures were taken in March and he is substantially bigger now and into even more mischief! 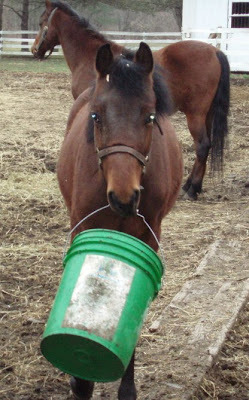 His favorite activity is to take an empty five gallon pail and play with it. First he picks it up and carries it, swinging it to and fro. Then he gives it a fling and the chase is on! He races after it, his teeth bared, his head against the side of the pail and he rolls it as fast as he can go. When it hits a stone and turns unexpectedly, he falls to his knees next to it, bangs it with his head to start it rolling again and the race resumes, often with substantial rearing, kicking and bucking. He does this time after time, going as fast as he can. Sometimes he manages to get the bucket under the fence and then playtime is over until someone retrieves it. 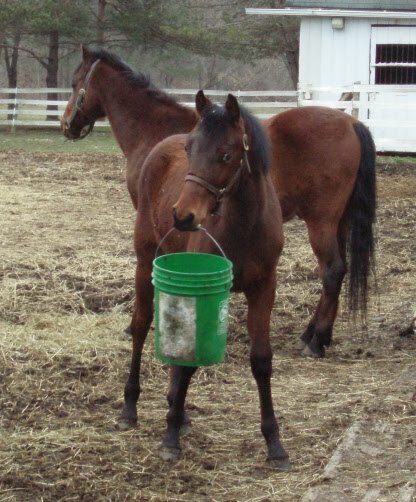 I've learned to fill two buckets when he and Mickey (seen in the background) are out and leave one as a toy. Otherwise Nate kicks one over! Nate has no official name yet, so I call him Nosy Nate (it seemed better than Hey, You)--a fitting name for someone who has his nose into everything! Mickey is the leader of this herd of two and takes no sass. 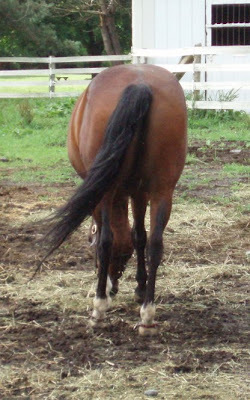 Which is really funny as Mickey is one of the mildest horses I know! So, happy first birthday, Nate! All those fireworks were for you! P.S. Yes, for those of you who check the time I post, it is just around 8:00! Just in case you have to get in bed early if tomorrow is a work day! We won't even go into how many photos it took to get these four good ones. 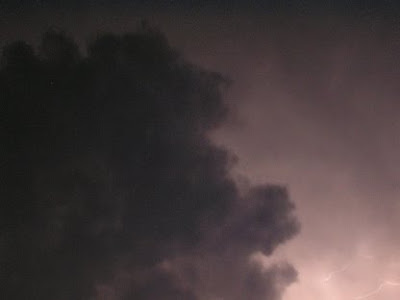 Do you love thunderstorms? 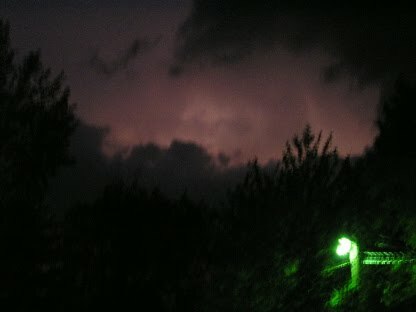 I go out onto the porches and stand where I won't get wet, but no windows between me and the storm! The last one has quite an eerie feeling to it. It was a pitch black night, so any light is strictly from lightning. Too cool, eh? It's been a scorcher here for the past two days, with several more to come. A true "heat wave". We really need rain and it was nice this last week to have cooler temps. I hope everyone is enjoying the holiday weekend. The post I had envisioned for tonight is not happening--the pictures won't download and I've spent almost half an hour trying. So maybe tomorrow night will be better--and I think the pics are definitely worth a look! What I'm listening to: Super Hits of Ronnie Milsap! LOVE his stuff! For those of you unfamiliar with Ronnie's music, it includes Daydreams About Night Things, Pure Love, Still Losing You, Stand By My Woman Man. I must admit to having it cranked a bit louder than I normally do, but it reminds me of a different time in life and with many fond memories. What music does that for you? On my MP3 player: Randy Travis (what's not to love? ), the Mamas and the Papas, the soundtracks to Shall We Dance and Dirty Dancing (still missing Patrick Swayze). I'll add Ronnie Milsap to the mix. I'm spending some time getting things caught up. The prizes for the 200th blog post are almost done (finally!!! ), I've been finishing up some long-term classes and getting ready for some new ones in the fall. Found the top of my big desk today! Does anyone have suggestions for storing oversized patterns--like 11 x 17 or larger? Hard to keep them flat, sorted and unwrinkled. And, yes, I still love my Dyson cleaner. Can't say enough good things about it. I even clean my horse brushes with it! Enough nonsense for tonight. Back tomorrow with (hopefully) the intended post! Happy birthday, America!!! What a great country we live in. 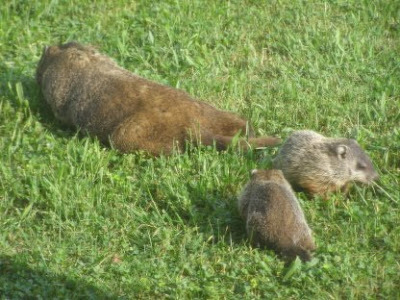 There have always been woodchucks living under the back porch. And usually there is a single birth to add to the population each year. This spring was different. Imagine my surprise when I looked out and saw the mama woodchuck with two babies! And they are a bit different color than normal. So I ran to get my camera. Right after I took the first photo, two more babies appeared! And then two more appeared! Six babies in all! Too big a spread for one photo, so here are four sibs. And mama with two others. Needless to say, there are woodchucks everywhere! 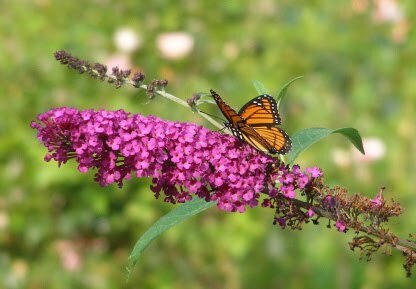 They are under the sheds, under both porches and even in among the lilac hedge. I think there is even one near the mailbox! Lynnie is fascinated, but they are too quick to get much more than a glimpse. 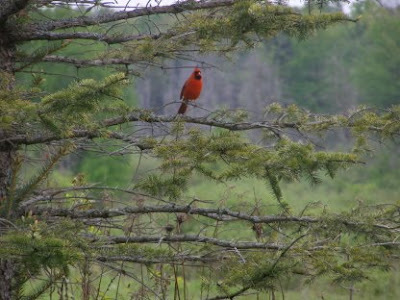 This male cardinal perches on the spruce tree that I can see from my sewing room window. And he sings his heart out. Occasionally the female joins him. There you have it, folks--the weekly menagerie report! I am going to try really hard to post every day from now to at least the end of July. So fasten your seat belts and hang on tight!